Ansonia Enameled Iron "MADELEINE", circa 1900\'s Excellent condition with sound Case: Black enameled iron with green columns with bronze caps. 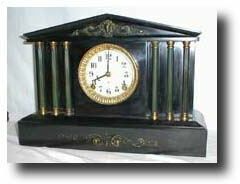 Nice mantel Clock 16.5" wide 11.5" tall. Works: 8 day time and strike on hour and half hour Reference: Ansonia Clocks by Tran Duy Ly Condition: Case - Excellent; Works and dial - excellent.